These questions have been asked frequently: Was the horizon of the Norwegian Nobel Committee too narrow? Were the committee members unable to appreciate the struggle for freedom among non-European peoples?” Or were the Norwegian committee members perhaps afraid to make a prize award which might be detrimental to the relationship between their own country and Great Britain? When still alive, Mohandas Gandhi had many admirers, both in India and abroad. But his martyrdom in 1948 made him an even greater symbol of peace. Twenty-one years later, he was commemorated on this double-sized United Kingdom postage stamp. Copyright © Scanpix. Gandhi was nominated in 1937, 1938, 1939, 1947 and, finally, a few days before he was murdered in January 1948. The omission has been publicly regretted by later members of the Nobel Committee; when the Dalai Lama was awarded the Peace Prize in 1989, the chairman of the committee said that this was “in part a tribute to the memory of Mahatma Gandhi”. However, the committee has never commented on the speculations as to why Gandhi was not awarded the prize, and until recently the sources which might shed some light on the matter were unavailable. 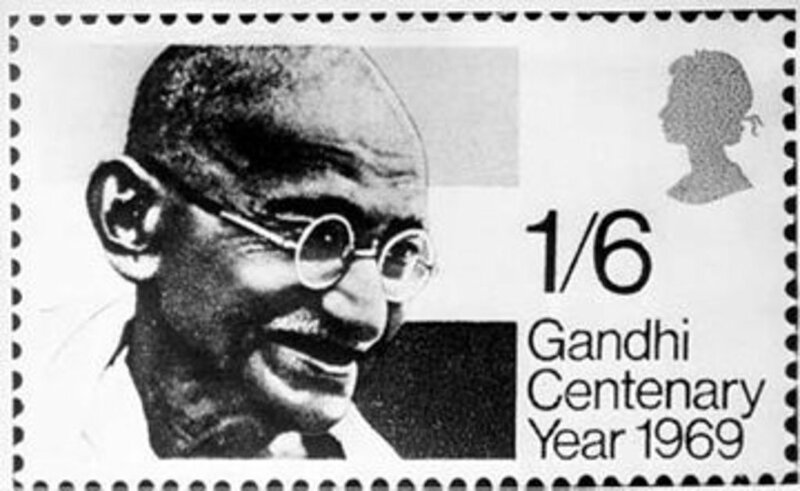 Mohandas Karamchand – known as Mahatma or “Great-Souled” – Gandhi was born in Porbandar, the capital of a small principality in what is today the state of Gujarat in Western India, where his father was prime minister. His mother was a profoundly religious Hindu. She and the rest of the Gandhi family belonged to a branch of Hinduism in which non-violence and tolerance between religious groups were considered very important. His family background has later been seen as a very important explanation of why Mohandas Gandhi was able to achieve the position he held in Indian society. In the second half of the 1880s, Mohandas went to London where he studied law. After having finished his studies, he first went back to India to work as a barrister, and then, in 1893, to Natal in South Africa, where he was employed by an Indian trading company. In South Africa Gandhi worked to improve living conditions for the Indian minority. This work, which was especially directed against increasingly racist legislation, made him develop a strong Indian and religious commitment, and a will to self-sacrifice. With a great deal of success he introduced a method of non-violence in the Indian struggle for basic human rights. The method, satyagraha – “truth force” – was highly idealistic; without rejecting the rule of law as a principle, the Indians should break those laws which were unreasonable or suppressive. Each individual would have to accept punishment for having violated the law. However, he should, calmly, yet with determination, reject the legitimacy of the law in question. This would, hopefully, make the adversaries – first the South African authorities, later the British in India – recognise the unlawfulness of their legislation. When Gandhi came back to India in 1915, news of his achievements in South Africa had already spread to his home country. In only a few years, during the First World War, he became a leading figure in the Indian National Congress. Through the interwar period he initiated a series of non-violent campaigns against the British authorities. At the same time he made strong efforts to unite the Indian Hindus, Muslims and Christians, and struggled for the emancipation of the ‘untouchables’ in Hindu society. While many of his fellow Indian nationalists preferred the use of non-violent methods against the British primarily for tactical reasons, Gandhi’s non-violence was a matter of principle. His firmness on that point made people respect him regardless of their attitude towards Indian nationalism or religion. Even the British judges who sentenced him to imprisonment recognised Gandhi as an exceptional personality. Among those who strongly admired Gandhi were the members of a network of pro-Gandhi “Friends of India” associations which had been established in Europe and the USA in the early 1930s. The Friends of India represented different lines of thought. The religious among them admired Gandhi for his piety. Others, anti-militarists and political radicals, were sympathetic to his philosophy of non-violence and supported him as an opponent of imperialism. In 1937 a member of the Norwegian Storting (Parliament), Ole Colbjørnsen (Labour Party), nominated Gandhi for that year’s Nobel Peace Prize, and he was duly selected as one of thirteen candidates on the Norwegian Nobel Committee’s short list. Colbjørnsen did not himself write the motivation for Gandhi’s nomination; it was written by leading women of the Norwegian branch of “Friends of India”, and its wording was of course as positive as could be expected. An ordinary politician or a Christ? In this photo Gandhi listens to Muslims during the height of the warfare which followed the partition of India in 1947. The name of the 1937 Nobel Peace Prize Laureate was to be Lord Cecil of Chelwood. We do not know whether the Norwegian Nobel Committee seriously considered awarding the Peace Prize to Gandhi that year, but it seems rather unlikely. Ole Colbjørnsen renominated him both in 1938 and in 1939, but ten years were to pass before Gandhi made the committee’s short list again. In 1947 the nominations of Gandhi came by telegram from India, via the Norwegian Foreign Office. The nominators were B.G. Kher, Prime Minister of Bombay, Govindh Bhallabh Panth, Premier of United Provinces, and Mavalankar, the President of the Indian Legislative Assembly. Their arguments in support of his candidacy were written in telegram style, like the one from Govind Bhallabh Panth: “Recommend for this year Nobel Prize Mahatma Gandhi architect of the Indian nation the greatest living exponent of the moral order and the most effective champion of world peace today.” There were to be six names on the Nobel Committee’s short list, Mohandas Gandhi was one of them. The Nobel Committee’s adviser, the historian Jens Arup Seip, wrote a new report which is primarily an account of Gandhi’s role in Indian political history after 1937. 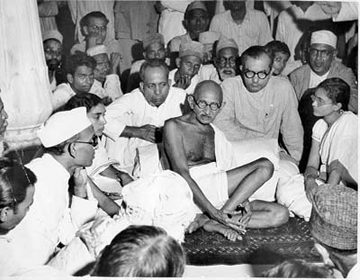 “The following ten years,” Seip wrote, “from 1937 up to 1947, led to the event which for Gandhi and his movement was at the same time the greatest victory and the worst defeat – India’s independence and India’s partition.” The report describes how Gandhi acted in the three different, but mutually related conflicts which the Indian National Congress had to handle in the last decade before independence: the struggle between the Indians and the British; the question of India’s participation in the Second World War; and, finally, the conflict between Hindu and Muslim communities. In all these matters, Gandhi had consistently followed his own principles of non-violence. The partition of India in 1947 led to a process which we today probably would describe as “ethnic cleansing”. Hundreds of thousands of people were massacred and millions had to move; Muslims from India to Pakistan, Hindus in the opposite direction. 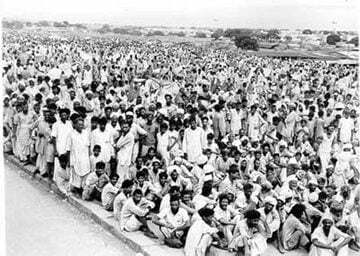 Photo shows part of the crowds of refugees which poured into the city of New Delhi. Gandhi saw “no place for him in a new order where they wanted an army, a navy, an air force and what not”. 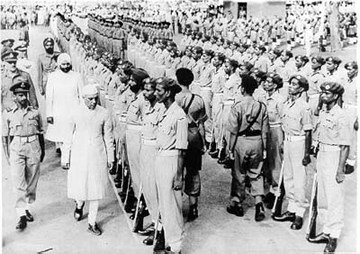 In the picture, Gandhi’s spiritual heir, Prime Minister Pandit Nehru, Defense Minister Sardar Baldev Singh, and the Commanders-in-Chief of the three Services, are inspecting a Guard of Honour at the Red Fort, Delhi, in August, 1948. Fifty years later, both India and Pakistan had developed and tested their own nuclear weapons. Gandhi had immediately stated that the report was correct, but incomplete. At the meeting he had added that he himself had not changed his mind and that “he had no place in a new order where they wanted an army, a navy, an air force and what not”. Both Jahn and Tranmæl knew that the first report had not been complete, but they had become very doubtful. Jahn in his diary quoted himself as saying: “While it is true that he (Gandhi) is the greatest personality among the nominees – plenty of good things could be said about him – we should remember that he is not only an apostle for peace; he is first and foremost a patriot. (…) Moreover, we have to bear in mind that Gandhi is not naive. He is an excellent jurist and a lawyer.” It seems that the Committee Chairman suspected Gandhi’s statement one month earlier to be a deliberate step to deter Pakistani aggression. Three of five members thus being against awarding the 1947 Prize to Gandhi, the Committee unanimously decided to award it to the Quakers. Nobody had ever been awarded the Nobel Peace Prize posthumously. But according to the statutes of the Nobel Foundation in force at that time, the Nobel Prizes could, under certain circumstances, be awarded posthumously. Thus it was possible to give Gandhi the prize. However, Gandhi did not belong to an organisation, he left no property behind and no will; who should receive the Prize money? The Director of the Norwegian Nobel Institute, August Schou, asked another of the Committee’s advisers, lawyer Ole Torleif Røed, to consider the practical consequences if the Committee were to award the Prize posthumously. Røed suggested a number of possible solutions for general application. Subsequently, he asked the Swedish prize-awarding institutions for their opinion. The answers were negative; posthumous awards, they thought, should not take place unless the laureate died after the Committee’s decision had been made. On November 18, 1948, the Norwegian Nobel Committee decided to make no award that year on the grounds that “there was no suitable living candidate”. Chairman Gunnar Jahn wrote in his diary: “To me it seems beyond doubt that a posthumous award would be contrary to the intentions of the testator.” According to the chairman, three of his colleagues agreed in the end, only Mr. Oftedal was in favour of a posthumous award to Gandhi. Later, there have been speculations that the committee members could have had another deceased peace worker than Gandhi in mind when they declared that there was “no suitable living candidate”, namely the Swedish UN envoy to Palestine, Count Bernadotte, who was murdered in September 1948. Today, this can be ruled out; Bernadotte had not been nominated in 1948. Thus it seems reasonable to assume that Gandhi would have been invited to Oslo to receive the Nobel Peace Prize had he been alive one more year. When Gandhi met the literature laureate Rabindranath Tagore, year 1940. There is no hint in the archives that the Norwegian Nobel Committee ever took into consideration the possibility of an adverse British reaction to an award to Gandhi. Thus it seems that the hypothesis that the Committee’s omission of Gandhi was due to its members’ not wanting to provoke British authorities, may be rejected. In 1947 the conflict between India and Pakistan and Gandhi’s prayer-meeting statement, which made people wonder whether he was about to abandon his consistent pacifism, seem to have been the primary reasons why he was not selected by the committee’s majority. Unlike the situation today, there was no tradition for the Norwegian Nobel Committee to try to use the Peace Prize as a stimulus for peaceful settlement of regional conflicts. During the last months of his life, Gandhi worked hard to end the violence between Hindus and Muslims which followed the partition of India. We know little about the Norwegian Nobel Committee’s discussions on Gandhi’s candidature in 1948 – other than the above quoted entry of November 18 in Gunnar Jahn’s diary – but it seems clear that they seriously considered a posthumous award. When the committee, for formal reasons, ended up not making such an award, they decided to reserve the prize, and then, one year later, not to spend the prize money for 1948 at all. What many thought should have been Mahatma Gandhi’s place on the list of Laureates was silently but respectfully left open.